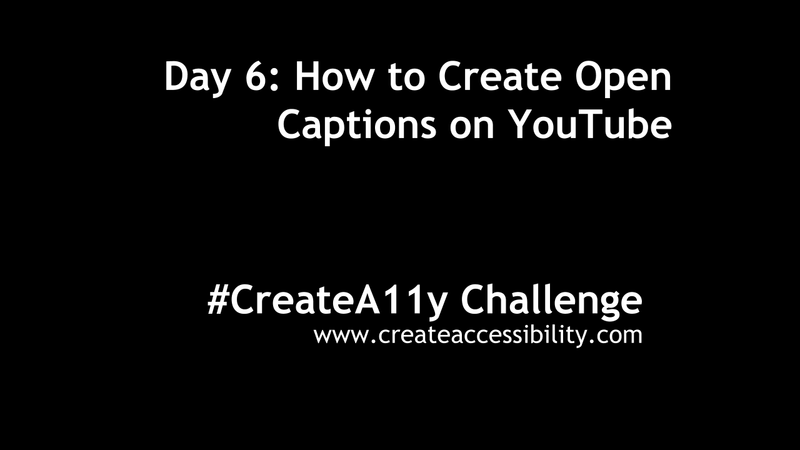 Today's challenge is to Open Caption a video you own on YouTube. The difference between open and closed captioning is simple. Closed captioning is user controlled and relies on the user to turn on. Programming on television is the best universal example of this. In the US, the FCC requires shows broadcast on television be closed captioned with few exceptions. Sometimes that is done live for events like the SuperBowl or during News Broadcasts. Otherwise it is done in advance for your typical sitcom. In either case, the user must enable closed captions for them to be displayed. Open Captioning means that the captions are always displayed and the user can't remove them. You see open captioning on media intended for mobile devices or on digital signage. My review of Apple Clips and its use of Live Titles is considered open captioning. When you share your Clip with Live Titles the user cannot turn the captioning off. Prerequisite: Closed captioned video hosted on your YouTube channel. Open Captioning is recommended when the audio quality of your video is less than desirable, if you're sharing your video on social media and will most likely be watched on a mobile device, or displayed on digital signage. As a classroom teacher there are lots of advantages to open captioning content hosted on YouTube. Open Captions will ensure that students see the captions paired with audio. Research suggests that captioning helps promote comprehension and improves memory retention, this yt:cc=on tag will not only create accessibility but can also improve achievement.